One hundred years ago, a patriotic adventurer from the Midwest happened upon a network of deep, red rock canyons and towering sandstone monoliths previously known only to indigenous peoples near present day Grand Junction, Colorado. It was love at first sight for John Otto, a conservationist who bore striking similarities to the legendary John Muir. Not long after Muir became enamored of the Yosemite Valley, Otto fell head-over-boots for this stunning landscape in the western shadows of the Rocky Mountains on the shores of the Colorado River. With pick and shovel, Otto carved trails out of sandstone outcroppings that snaked through the pinyon -juniper woodland of the high desert. This was his domain. He lived here, got married here, and eventually was hired by the National Park Service as its first custodian for this land. With his unique voice (and prolific writings) crying out in the wilderness, he promoted the inviting canyons to all who would listen. In 1911, President William H. Taft responded to Otto’s unrelenting pleas and designated this geological wonder as Colorado National Monument. Today, you can follow Otto’s historic trails (which are part of the park’s 43 miles of hiking trails) and enjoy their quiet splendor. Golden eagles and peregrine falcons soar high above. Desert bighorn sheep climb the rocky promontories. Nine species of colorful lizards play hide-and-seek on the canyon floors below. Waterfalls splash over sandstone cliffs to thirsty flora and fauna. Everywhere you look rise enormous layers of stratified rock – pages in this open history book of the Earth’s geology – including rocks that are 1.8 billion years old. 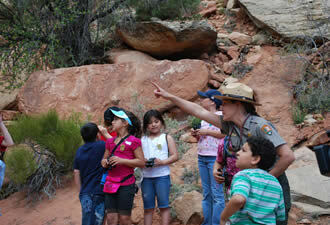 Come to the visitor center where ranger programs offer learning experiences every day from mid-May to early September. Program topics range from wildlife and geology to local history and vegetation. 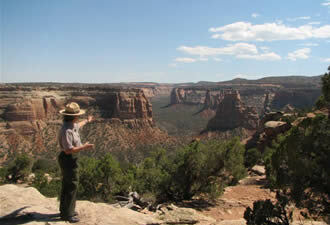 Rangers give guided “walks and talks” to visitors eager to stretch their legs while learning about their surroundings. The Junior Ranger program offers youngsters a chance to explore the park – and earn a Junior Ranger badge – by completing exciting activities. A special “loaner” backpack is available for families with children. There is much more to Colorado’s best kept secret than Mother Nature’s handiwork. Take the road, for instance. An engineering marvel, Rim Rock Drive offers 23 breath-taking miles of panoramic views, but it also has a story to tell. The drive, built by enrollees in the Civilian Conservation Corps and the Works Progress Administration and completed in 1950, was recognized as a national treasure when it was listed on the National Register of Historic Places in 1993. Today, it accommodates motorists as well as bicyclists and offers spectacular views from every vantage point. 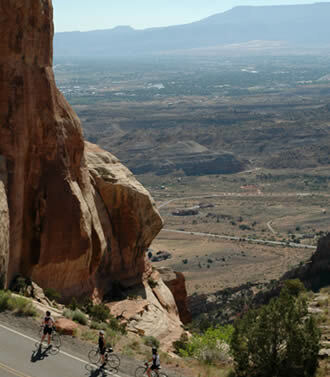 The road is a “breath-taking” part of two popular long-distance bicycle tours every year, giving hundreds of cyclists the chance to climb about 1,700 feet from the Grand Valley to the road’s highest elevation. Speaking of high, the park’s iconic symbol is a 450-foot monolith that John Otto christened Independence Monument. This spire attracts hundreds of rock climbers every year, including an annual 4th of July ascent to hoist Old Glory on the summit. This patriotic tradition was initiated by John Otto, an American visionary whose spirit of adventure welcomes you today.